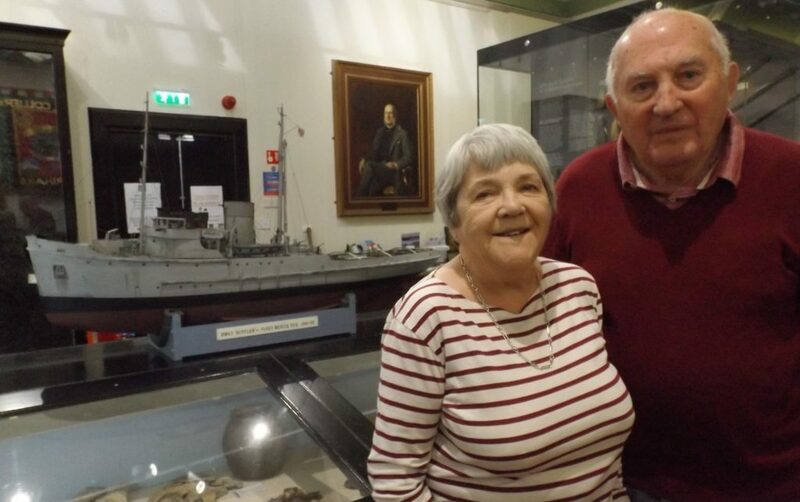 A model of the HM Rescue Tug ‘Bustler’ and a two page description, of the boat, was donated to Campbeltown museum last year by Philip Scales. He had made the model as recently between 1996/1997. Elaine McChesney, the recent museum curator tracked down my sister in Arran, Ann Brown née Leckie and myself in North Berwick and we visited the museum last September. My father, Lieutenant Commander Archibald MacNeilage Leckie, was captain of the ‘Bustler’ as well as many other tugs during the period 1940-55. A 1947 telegram from master of Queen Elizabeth refers to the occasion when the QE went aground in Southampton. The Bustler was called in to coordinate 17 other tugs in a successful action to re-float her. The outcome was to try to find more of the human side of the life and times of Bustler and its crew, especially as we knew that many of its 45 crew were Campbeltown and Kintyre natives. The objective I had in mind is a shorter document that might be of considerable interest to visitors and readers of the Courier. During the months since our visit, I have gathered a wealth of material from RN service records, family photos, official books, The Campbeltown Book, newsletters and my father’s curriculum vitae. I have also found that another Bustler model is on show in the National Museum in Edinburgh. Most of my father’s papers are with family in Australia. He died there in 1981 – and the family have some that should be of interest, so I am arranging to bring them over here. One book stands out: ‘The Tattie Lads,’ by Ian Dear, published by Bloomsbury in 2016, available from Amazon at £22.50 hardback, also on Kindle. Chapter one tells the history and background of the Rescue Tug Service (RTS). Chapter two is simply named ‘Campbeltown.’ Its 40 pages tell how the town became the world centre for rescue tug boats in the First World War and reopened in the next war. The chapter charts the rise of the U-Boats and the threats from aircraft, the re-establishment of the Royal Naval base from six tugs in 1939 to 85 world-wide by the end of the war. Campbeltown became the national training base and was responsible for naval discipline, including pilfering, looting and even a minor mutiny. Incidents, some amusing and others not so give a flavour of what life was like in those days, especially the anecdotes of the actual rescues that were attended round the world. he only direct reference to my father, Lt Archie Leckie, is at pages 153/4 while stationed at an outstation of RTS at St John’s, Newfoundland. In March 1942, he had strongly reported after a tricky rescue with a tanker there that his then tug, Tenacity, should have had a modern towing winch. Shortly afterwards he was promoted to Lieutenant-Commander and appointed maintenance officer, rescue tugs base at St John”s. There is also a photo of ‘Bustler’ towing a conundrum used to lay the fuel pipeline Pipe Line Under The Ocean (Pluto) to Cherbourg after the Normandy landings. My father was mentioned in despatches for this action. I have donated a copy of the book to the museum and Elaine has placed it beside the model. I think there should, be a much bigger project to tell this story. My sister and I have many happy childhood memories of Bustler, and have even sailed on her but there are gaps as we were children at the time. We were shielded from the dangers my father faced and, of course, he was unable to tell us where he was going. Another of our difficulties is that having left school and Campbeltown in 1953, we also lost touch with Kintyre people. We are interested in any written experiences, or details of any surviving sailors.